Editor's Note: This is an edited sermon David Hansen delivered August 21. I am your interim pastor and as such I am new to this church and to this community. I am learning about you. You should know something about me. Sally and I celebrated our 50th wedding anniversary this past June. We have three children and 11 grandchildren. We both grew up in pretty traditional, middle-class white Anglo-Saxon Protestant families. So it is kind of a surprise to us that our own family is so different from the one we knew as children. Our oldest daughter Allison is married to Mustafa and they have four children and they are Muslim. Our adopted son, Alexander, is bi-racial, which means black or African-American, and he has 5 children. Our youngest daughter, Elizabeth, is married to a Frenchman and they have two children. So one-third of our family is Muslim, one-third is black, and two-thirds are first generation in this country and hold dual citizenship. Now when we got married 50 years ago we did not set out to create this kind of family, but here we are. In this time when people are understandably concerned about immigration and racial tensions in this country are high, here we are. Our family is not unique. There are lots of families like ours—interracial, interfaith, and international. It is an interesting time to be alive. And, it is a great time to be the church. And we would not change our family for anything. Now all this preamble does not have anything to do with the text today, but I thought you ought to know more about who I am and who we are. So now let’s turn to the text. The story of this woman—this bent-over woman—became one of the most challenging and life changing stories for me many years ago when I had the good fortune to participate in an exchange program with a partner church in Germany. There I met a woman who introduced herself to me as a Christian educator. I wasn’t sure what that meant, so I asked her what a Christian educator did. She told me that she went out into the community to conduct Christian education programs. As I recall, she told me that she was working with a group of low-wage workers in the evening and with a group of single mothers who lived in public housing and with community immigrants in the afternoons. Three different groups, but they were all studying the story that we heard today about this bent-over woman. Then she showed me what she did when she met with these groups. She opened a traveling kit and took out a mat, maybe a square yard, laid it on the floor. On each side of the mat she placed a wooden block. On each block was a word. The blocks were labeled: politics, economics, social, religion. Then in the middle of the mat she placed a doll that stood maybe two feet tall. The doll was a woman and she was flexible, so when the teacher put the doll on the mat the doll was bent over, like the woman in Luke’s account. Then she read the story and asked, “How do you think this woman feels?” I am asking you this question now. How do you think she feels? What do you imagine it is like to be this woman? Can you think of reasons why she was bent over? Perhaps she suffered from a medical condition and could not afford a doctor. Maybe she has arthritis. Maybe she was in prayer. Maybe she had worked in a job where she had to do a lot of heavy lifting, and her body was just worn out. 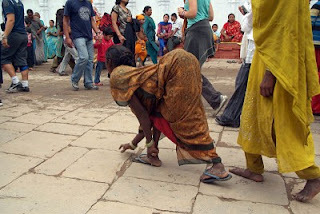 Maybe her bent over condition symbolized her social status, her poverty, or her inability to access health care. The conversation explored possible political, social and economic conditions that might have contributed to this woman’s situation. The woman did not stay bent over. Do you remember what happened? Jesus came to her. He talked to her. He touched this untouchable unclean woman. He recognized her as a child of God, and she stood up. I have been thinking about this gospel story as I watched the news this week. Sally and I both grew up in Wisconsin. I served a church in a Milwaukee suburb. So I have been watching the civil unrest there with more than a little interest. I know the Black Lives Matter movement and the uprising in Milwaukee have lots of variables. It is a complicated situation and everyone has a point of view. Almost 20 years ago, in 1998, two scholars, Douglas Massey and Nancy Denton, wrote a book entitled American Apartheid (Harvard University Press). 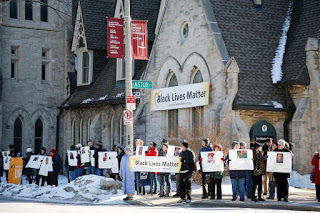 They concluded that Milwaukee is the most racially segregated city in the United States. There is a long history there. But there is also great hope. 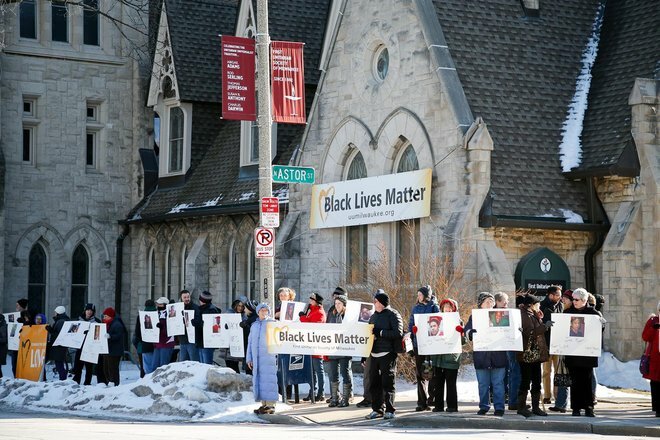 The Chief of Police in Milwaukee has issued a call for clergy and people of faith to come together and start working with one another to create a better, healthier community. I remember in the 1960s there was a national movement called “Living Room Dialogues.” Reuel Howe wrote about it in a book, The Miracle of Dialogue (1963). Caring enough to listen to each other’s stories is where healing begins. I have been thinking about Milwaukee this week. I have been thinking about 23 Christian ministers in Missouri who were in court this past week. They went to the state capital to call upon the legislature to expand Medicaid and were arrested for the crime of trespassing on government property. Even though they were in the public gallery, they were arrested for trespassing, tried in court, and convicted. I am glad they were there and are standing up for the rights of people who bear the heavy burden of injustice. There are stories like this in the news every day of the week. I am convinced that we need to look with unflinching focus at the oppressive events that seem to pile up each day, and weigh us down, and threaten to bend us and break our spirit. We need to lament and weep for this world that God loves. And then we need to stand up and look each other in the face and say, God has not given us a spirit of timidity, but a spirit of courage. Let us rise up. There is a balm in Gilead. There is healing that is sure to come. The Book of Genesis tells us that there is Spirit that hovers over the darkness and moves across the chaos. This Spirit is at work in the hearts of women and men and children who are committed to overcoming the world. This Spirit is loose upon the world. You cannot hold it back. As people born of the Spirit you and I can live effectively in the chaos of the present with the high destiny of children of God.